Hand craft your very own “halo” necklace in this traditional silversmithing workshop. Your tutor will help you make a stunning, sterling silver pendant, complete with an optional Swarovski or semi precious bead attached. You will have the choice to make either a double Halo pendant or a more chunky single halo. 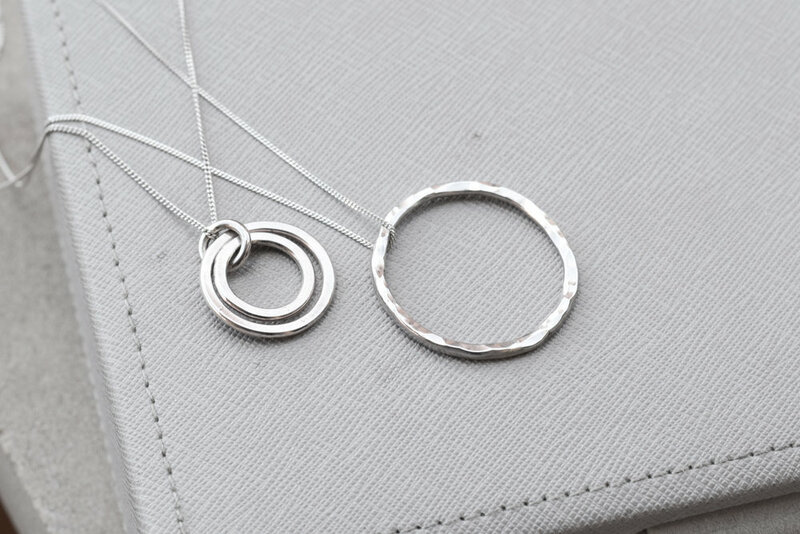 You’ll also be given a sterling silver chain at the end of the workshop to complete your necklace making it ready to wear or gift to a loved one! This workshop will cover many traditional silversmithing techniques including shaping, filing, soldering, hammering, plus many more exciting skills. You’ll make the necklace mostly entirely yourself with some help and guidance from your tutor. The silver used in the class is 925 Solid Sterling Silver. This workshop typically lasts around 2-2.5 hours in total and is aimed at complete beginners but all are welcome. This is a very hands-on class. If you normally wear glasses for reading, we recommend you bring these. Please wear old clothes and closed-toed shoes. Long hair must also be tied back. We currently have no strict age limit on classes but please email us before booking a space for anyone under the age of 16 just to confirm this with us. Anyone under the age of 16 must attend with a participating adult. This workshop and all workshops hosted and ran by Noctua Jewellery & Workshops LTD are copyrighted. Any content, information, works, publications and information given during these workshops are only to be used for private and individual use. This information is not to be copied, duplicated, performed, reproduced, distributed, modified, create derivative works, transmitted or in any way exploited such content. (In short, you are free to go home and re-produce the jewellery we teach you to make and also use the information given to make more jewellery to sell on, you are not permitted to use the information given to copy our workshops, teach others or use the information in an educational format for gain.) By booking onto any of our workshops and/or courses you have, by law, agreed to the above.